Mpow Bluetooth receiver features a quick-turnaround that gives you 2 hours of playback from a 5-minute charging. Note1: Please use 5V standard charger to charge Mpow Bluetooth adapter. Note2: Do not use quick charger/ flash charger/ fast charger with output voltage over 5V. 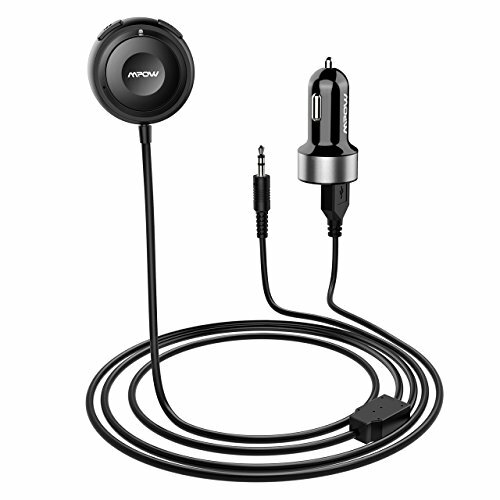 Note1: Mpow car adapter will auto-off if it is disconnected for 10 minutes to save energy. Note2: If you want to turn Mpow off, please kindly turn the switch to off. 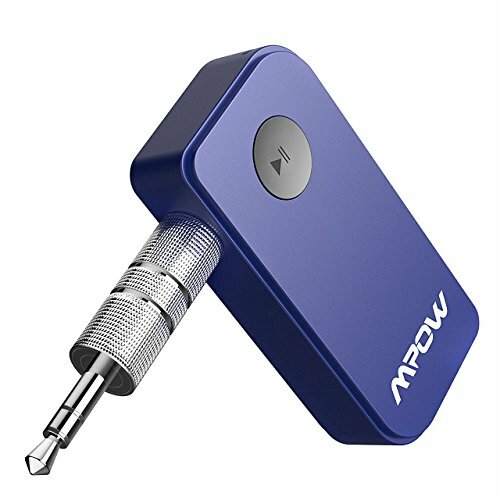 When the Bluetooth function of a mobile phone is ON, Mpow Bluetooth aux adapter will connect with the last mobile phone automatically. 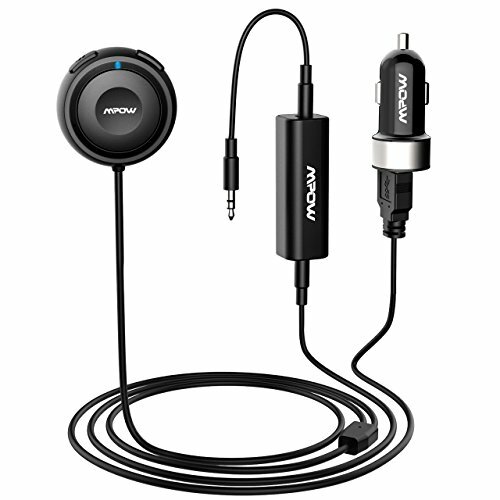 1 SECOND SWITCHING BUTTON: Mpow Bluetooth car aux adapter designed with PHYSICAL ON/OFF SWITCH & HUMANIZED WIDENED VOLUME/TRACK BUTTON on the side for quick and convenient control for your hands-free talking and listening experience. 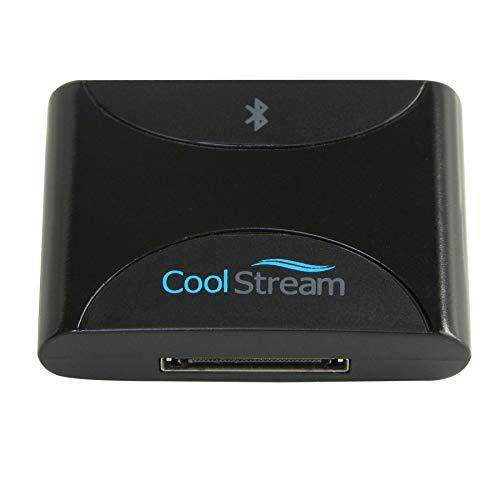 WIDE COMPATIBILITY RECEIVER: Stream stereo music wirelessly through most home audio systems, car stereo system, and wired headphones from Bluetooth enabled devices like smartphones, tablets, MP3 players, etc.(HFP/HSP/A2DP/AVRCP/CVC6.0). Warranty: Every Mpow product provides 18 monthes warranty. Goose Neck Design and 1.44 LCD Display Screen Flexible metal hose, Convenient to adjust its direction. Large LCD Screen shows the incoming phone number, current song's name and the voltage of the storage battery clearly. Easy Installation,Plug and play, Easy to use. Memory Function Fast Bluetooth pairing. Once paired, the FM transmitter will automatically connect with the last paired smart device when turned on next time. Clear Sound and Hand-Free Calling Adopted advanced interference and noise cancellation technology - CVC technology creates full duplex sound and suppresses noise and wind. Take hands-free calls for pleasurable driving experience! Specifications: Bluetooth Version: V3.0 + EDR Effective Bluetooth Range: 10 meters FM Frequency: 87.5MHz - 108.0MHZ Working Voltage: 10V~24V Audio Input/Output: 3.5mm audio interface USB Charging Port: 5V/2.1A Compatible Phone Models: Most devices on the marke that Bluetooth enabled devices such as Samsung, HTC, Blackberry, Sony, Tablet etc. NOTE: 1.Please do not violently rotate the head part when using it (the rotation angle shall not exceed 90 ). 2.Tune it to an unused frequency. 3.The max input & output current of the transmitter varies with charged devices, due to charged devices are able to limit output current automatically. 1.44'' Large LCD Backlight Display Screen: 1.44 inches screen provides clear display: song name, incoming phone number and voltage of the car battery. Crystal Sound and Memory Function: Adopted advanced interference and noise cancellation technology - CVC technology creates full duplex sound and suppresses noise and wind. Our factory had improved the using experience to reduce interference. Also, our FM transmitter could automatically connect the next time if had been connected before. 1. 8" Tuft color and large screen designed for brighter and clearer display, 1. 8"Color screen and 360 flexible hose offer you a much wider viewing for incoming phone number, battery voltage, song name, FM frequency, connected Bluetooth device and more. CUSTOMIZE YOUR MUSIC WITH EQ Make the best sound quality for you, this FM transmitter Bluetooth supports 5 equalizer modes including normal, rock, pop, jazz and classical when stream stereo music via TF card or U disk. Support A2DP and MP3/WMA/FLAC/AAC. 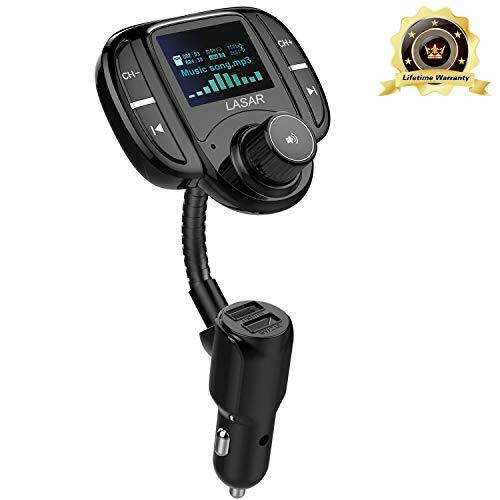 Voice report hands-free calls This Bluetooth FM transmitter for car will loud voice report through the car radio and show the incoming phone number for notice. It is a safe design and suits for hands-free law. Civic noise reduction enable to answer a call. Power off and 3 USB ports save your car battery: Just long press the buttons to power off and no need Plug or unplug it out from your car socket every time. Support 3 USB ports: one for USB disk, other two ports can charge two devices at the same time. 4 WAYS TO STREAM MUSICS Streaming stereo music freely in 4 ways: A: Bluetooth connection; B: U Disk( 32G); C: Aux Input; D: TF Card( 32G). And this FM transmitter is compatible with Samsung, LG, Sony, Android , MP3 player and most devices on market. AUTOMATIC RECONNECTION The FM transmitter Bluetooth will auto-reconnect with last paired smart device(When its Bluetooth function is enabled for the next time when it turns on. And it has low power consumption MTK chip ensures stable Bluetooth connect. Volume control This Bluetooth FM transmitter for car has the volume control. Please right rotate the call button to volume The Bluetooth car transmitter up. Warranty: Please kindly rest assured that VicTsing provides 1 year warranty. (CVC) technology offers you a crystal clear calling and saferdriving. the "Right"USB Port) let you be absorbed in music playing when driving. automatically detects your devices and charges all cellphone or iPad at optimal speed. Charge two devices simultaneously without damage to the battery. and car voltage, provides you portable driving travel. 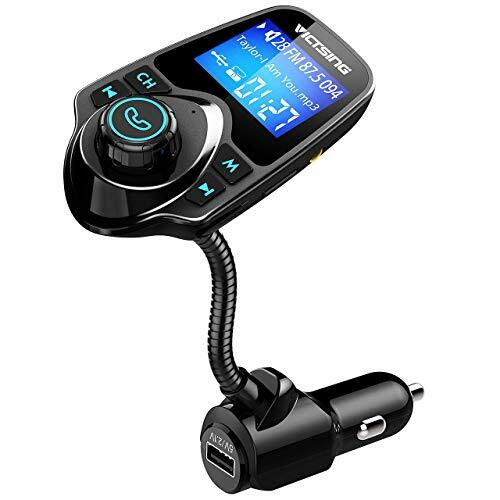 PAIR IN SECONDS: Just plug the optimum Bluetooth FM Transmitter into the car cigarette lighter, tune the car radio to the same frequency (range from 87.5 to 108 MHz). Then let your phone/audio player pair it via Bluetooth/USB flash driver. 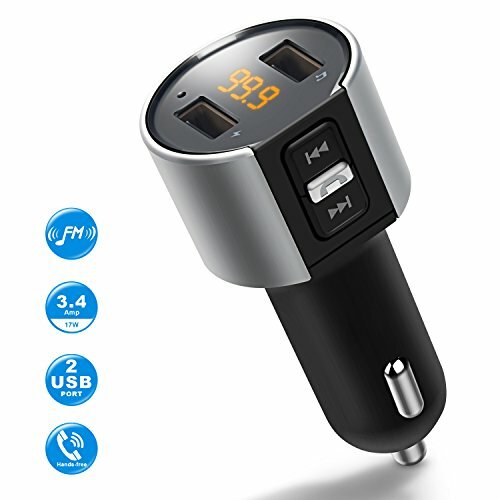 2 PORTS USB CAR CHARGER: Comes with 5V-2.4A and 5V-1A charging ports which output 3.4A total, support charging two devices simultaneously, better-charging performance! ANSWER CALLS HANDS-FREE: High-performance microphone with Noise Suppression (CVC) technology, grants you crystal clear call. Answering/redialing/dismissing or ending a call just simply click a button. Seamlessly switches between incoming calls and music; Drive more safely. IMMERSE IN HiFi MUSIC: Insert a USB flash drive which contains MP3 files into the RIGHT USB port and enjoys it. If that's not enough, it can also support your playlist with a full range of audible frequencies with no distortions of the original signal from your MP3, iPhone, Android Smartphones and more Bluetooth enabled devices. 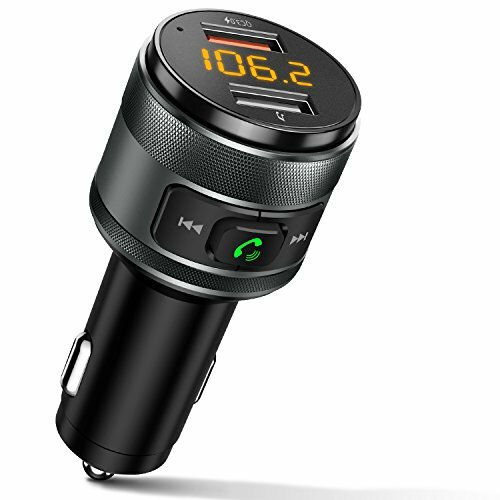 WIDE COMPATIBILITY: Bluetooth Car FM Transmitter can be paired as a hands-free kit with all Bluetooth enabled devices, such as iPhone, iPad, Tablet, Samsung, HTC, Sony and other Andriod Smartphones; Stream music and calls directly from your mobile devices to car stereo system via FM radio signal ( 87.5-108.0 MHz). Drive completely safe - with both hands on the steering wheel - while still being able to answer phone calls thanks to the TaoTronics receiver. Benefit from the cVc 6.0 noise cancellation that will make your calls clearer and eliminate static noise when listening to music with the increased noise isolation circuit design. Compatible with HFP, HSP, AVRCP, A2DP, and Bluetooth 4.2. Find the ideal spot for the receiver in every car thanks to its two installation modes: via the magnetic base that is mountable with 3M adhesive tape or the integrated air vent clip. Thanks to these options the receiver fits in every car model and can be fixated exactly where you need it. Connect up to two Bluetooth compatible devices with the receiver and enjoy multitasking freedom at its best. If you are in the middle of your favorite playlist and someone calls you, don t worry: easily take the call and as soon as it is finished, your music will automatically resume where it stopped. We doubled up your safety while driving with the extremely user-friendly controls. Don t tediously look for the right button to push, but find it on your first try with the backlit design and the clearly separated controls. Manage your music with the Multifunctional Button to Pause / Play your tunes (also used to Answer/ Reject your calls), the Previous Track / Volume , and Next Track / Volume + buttons. TaoTronics gives you a completely free of charge USB car charger (5V 2.1A) so your car is perfectly equipped for every road trip, adventure, or work commute. The dual output provides valuable power to two devices simultaneously and your phone or tablet will be charged by the end of your drive. PLEASE NOTE: OTHER BUYER follow our listing have NO the same PACKAGE as ours, and they cannot assurance the QUANTITY!!! earphone, headset, or any other audio device, making wireless music available at once. time ,which makes it more powerful. WIDE COMPATIBILITY : Can connect two Bluetooth devices at the same time. Compatible with most smartphones and Bluetooth electronics, ideal for home or vehicle audio systems. LONG TIME WORKING : Can provide up to 5 hours playing time, only 1 hour charging time. AUTOMATICALLY RECONNECT : Just turn on the Bluetooth of the cell phone first, and then turn on the Bluetooth receiver, The Bluetooth Receiver can be automatically paired. 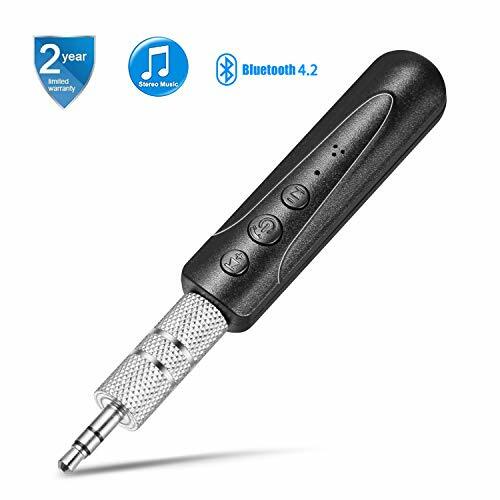 BLUETOOTH 4.1 RECEIVER : Support Bluetooth 4.1/HFP/HSP/A2DP/AVRCP, you can enjoy music and hands-free calls from your smart phone in premium-quality sound. Up to 33ft connection range guarantees low signal delay. RESCUE YOUR BOSE SoundDock. Use the CoolStream Duo to Bluetooth your music from your iPhone or Android phone to your Original Bose SoundDock, Bose SoundDock I, SoundDock II, Portable SoundDock or SoundDock 10. NOT COMPATIBLE WITH ALL CARS OR DOCKS. NOT for CARS such as Audi, Infiniti, Mercedes and BMW with 30 pin cables we recommend the CoolStream CarPro. Please check compatibility prior to purchase. WORKS WITH all models of iPhone, Android phones and any other Bluetooth enabled devices. Compatible with Victory Motorcycle iPod cable. ONE YEAR WARRANTY and customer service located in New Hampshire. Click Sold by CoolStream for contact info. We are happy to answer any compatibility or warranty questions. NEED BLUETOOTH for your car stereo with AUX jack, wired headphones or stereo receiver? Plug them into the Duo using its built-in AUX Jack. Rechargeable battery for 5 hours of streaming and audio cable for 3.5mm AUX Jack included. 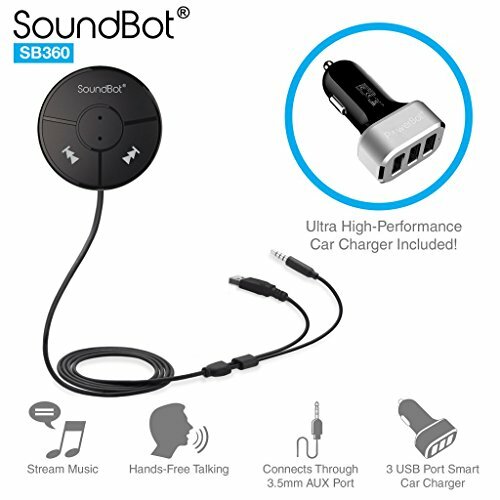 Instant solutions to turn car stereo system into bluetooth wireless environment for hand free calls on the road and access to the music on mobile devices. On board 3 control button functions for answering/ending call, skip/volume up,backward/volume down. Fashionable and stylish design design provides maximum compatibility to the vehicles. Supports Bluetooth A2DP profiles. Backward compatible with previous wireless standards. 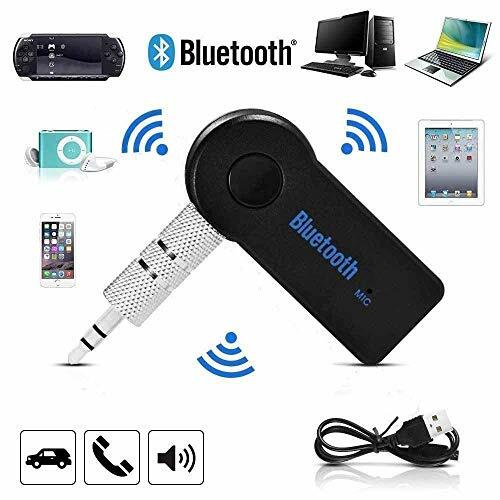 Pairs with all compatible Bluetooth enabled device such as Windows Phone, Smartphone, Android, Apple, iPhone 6, iPhone 6 Plus, Samsung Galaxy Note 4, Galaxy S5, Kindle, Kindle Fire, iPad, Nexus, Google, Tablets, Laptop, PC, & more. What's More: At TaoTronics, not only we offer high quality products, we back them up with a 12-month warranty and another 18-month which could be extended. Warranty: At TaoTronics, not only we offer high quality products, we back them up with 18 month warranty and a 30 day money back guaranty. Wide Compatibility: VicTsing wireless in-car Bluetooth FM Transmitter is well compatible with most Bluetooth enabled devices, such as iPhone, Samsung, HTC, LG, Blackberry, Sony, Tablet and iPad etc. More Surprises: Supports hands-free calling with microphone; supports TF/Micro SD memory card in FAT format up to 32G; supports A2DP; supports MP3/WMA/FLAC format; support AUX output and input. QC 3.0 smart quick charge and 5V / 2.4A Dual port, you will charge your devices faster and safer, because KM28 has built-in over-current protection, over-voltage protection, intelligent temperature control and short circuit protection. Works well with most Bluetooth enabled devices, such as iPhone, iPad, iPod, tablet and smart phones etc. The Bluetooth radio adapter with wide compatibility can support TF/ Micro SD card in FAT format up to 32G, A2DP, MP3/ WMA format and also AUX output/input. 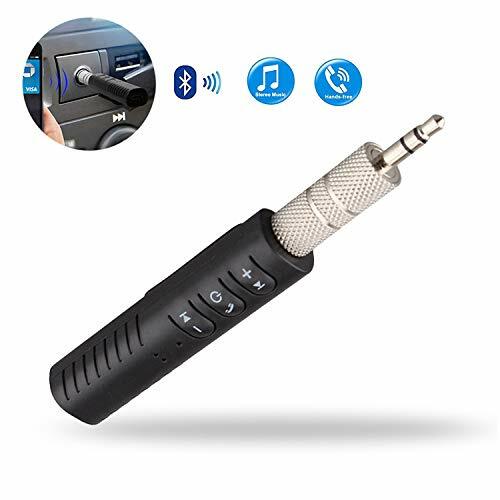 The wireless receiver car kit features Bluetooth V4.2 which can save energy and last for much longer and EDR to ensure faster data transmission rate and more stable connection between a Bluetooth device and the audio receiver. High Quality - adopted upgraded interference and noise cancellation technology - CVC technology creates full duplex sound and suppresses noise and wind; Built-in microphone feature supports hands-free talking reduce interference. Premium Sound Quality The Streambot uses updated wireless technology to adapt audio systems with Bluetooth capability. This small, compact device enables devices and stereo audio systems to be wirelessly controlled by Bluetooth 4.1. It features with A2DP technology to stream high quality audio. Just enjoy a crystal clear sound wirelessly. Play All Day 8 full hours of playing any audio you choose. Bluetooth 4.1 with A2DP technology can not only guarantee a crystal clear sound, but also ensure low battery consumption, thus allowing you to enjoy up to 8 hours non-stop music! And it only needs 1.5 hours to charge fully. Wide Compatibility Works with iPhone, iPod, iPad, Android Smartphones, Tablets, and other Devices, easily plugs into any powered Car & Home Stereo Sound System and Speakers via the 3.5 mm audio cable/adapter. Easy to Control Press the button on the face can answer/end/reject/redial a call and play/pause the music. Long press "+"/ "-" button on the side can turn volume up /turn volume down. Short press"+"/ "- " button can turn to next song /previous song. Packing List 1x Portable Bluetooth Receiver; 1x Micro USB charging cable; 1x 3.5mm audio Cable; 1x User Manual; Warranty Every Mpow product includes a 45 days money back & 18 month worry-free! Aloxim Bluetooth Car Kit HY82S brings Bluetooth connectivity to any car. Broadcast audio from your phone on an FM bandwidth and hear it through your car's sound system. Enjoy your music and make hands-free calls and fast charge your devices while you drive. 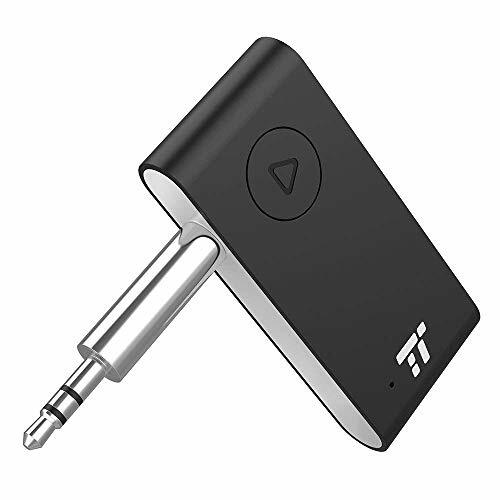 Wireless music streaming: Connect via Bluetooth to play your favorite songs or playlist on App such as Amazon music/Pandora/Tunein/iHeartRADIO /Spotify/SiriusXM over FM frequency, also play MP3 /WMA format songs stored on USB flash drive. Playing Auto-Switch : Automatically transfer from music streaming to incoming phone calls and switch back after hanging up. Car Battery Monitor : Real time detecting your car battery voltage condition and warning the abnormality by display flashing. Power Turn On/Off: Press the knob for 5 seconds to turn off the screen display and transmitting function and cut off power drain from car battery. To restart it by pressing the knob button. 1. Plug the car kit into your car cigarette lighter socket to power on. 2. Set your car FM radio to a vacant radio channel/station/frequency. 3. Press the knob till the LED screen blinks. 4. Turn the knob to tune the FM transmitter to that same vacant radio channel/station/frequency as your car FM radio. 5. Pair your cellphone's Bluetooth with the Bluetooth FM transmitter. 6. To get the best audio quality, please set the volume of your phone to maximum and then adjust the volume of your car stereo. You are not suggested to adjust the volume of your car speaker to maximum (this will bring too much noise). 7. Play music on your cell phone or make phone calls, then you will hear sound coming out from your car radio. 1. If there is a lot of static due to frequency conflict, please set car FM radio to another empty/vacant radio channel/frequency. Universal Compatibility: [2019 New Version]FM transmitting & screen display turn off function to cut off power draining from car battery. Aloxim HY82S car kit works with all Bluetooth enabled devices, such as iPhone, Samsung Galaxy, HTC, LG, Blackberry, Sony, Tablet and iPad etc. Compact and unobtrusive design makes it easy to fit in most kinds of 12V/24V car cigarette lighter socket. 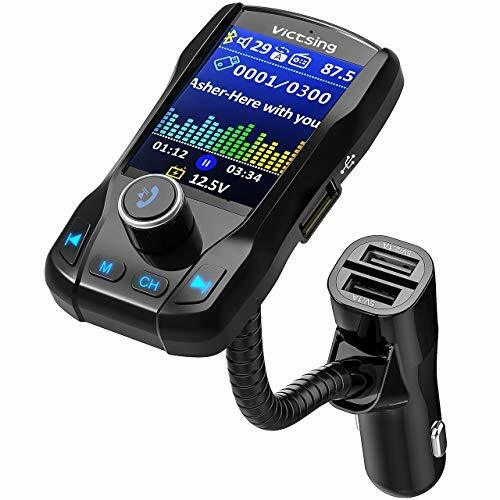 Hands Free Speakerphone & Music Streaming: Solid Bluetooth connection with A2DP+EDR allows you to stream music from your phone to car stereo system by FM transmitter function. Also easy to make hands free phone calls and navigation broadcast. Automatically switch from music playing to incoming call, and One press to answer/hang up the call. Convenient and safe for driving. Crystal Sound Quality: Aloxim HY82S car MP3 player utilizes interference and noise reduction CVC technology to create full duplex sound quality for both music streaming and calling. Built-in highly sensitive microphone with anti-interference, enhanced sound performance and echo cancellation and noise suppression DSP technology to ensure good calling experience. Noise issue exists for all kinds of FM transmitters, but Aloxim HY82S does one of the best work in the market. Quick Charge 3.0 & Monitor: Dual USB car charger equipped with one Qualcomm QC 3.0 technology USB port by up to 4X faster than standard chargers, capable of charging compatible devices to 80% in just 35 minutes. Another port is for normal charging and as a USB flash drive reader for music playing. Car battery monitor function can keep detecting your car battery since starting the engine and give an instant alarm by display flashing once battery abnormality happens. What You Get: Aloxim HY82S FM transmitter with Quick Charge 3.0, user manual, our worry-free 24-month warranty and friendly customer service. Liven up your road trips featuring a high-end CSR Bluetooth chip, our transmitter allows you to turn your car into a streaming machine! Enjoy all your favorite tunes and podcasts from the convenience of your smartphone and liven up road trips, drives to work or even time spent in traffic. Crystal clear calls featuring a built-in microphone and advanced noise cancellation technology, our transmitter suppresses background noise and wind so you can experience clear calls no matter where you are. Our transmitter also comes with magic Tape to adhere in the ideal place for smoother conversations. Full FM radio frequency range whether you tune into 88. 1 or 107. 9 or any station in between, once you find an empty frequency match it to the transmitter, pair it with your phone via Bluetooth and enjoy rocking out to your favorite jams. User friendly You don't need to have a lot of technical know-how with our CK310! 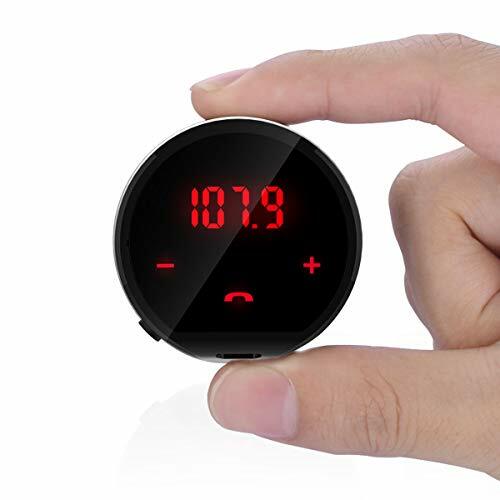 Designed for even those not technologically Inclined, our transmitter features a large, extremely responsive LED touch screen that simplifies the process of adjusting FM frequencies, answering or disconnecting calls, or playing and pausing your music. Long live your battery featuring a built-in battery designed to last up to 7 hours of Talk time, you can immerse yourself in your calls, music or driving directions! The rechargeable lithium-ion battery fully recharges in 2 hours, and the device is designed for use during the charge making road trips A lot simpler. 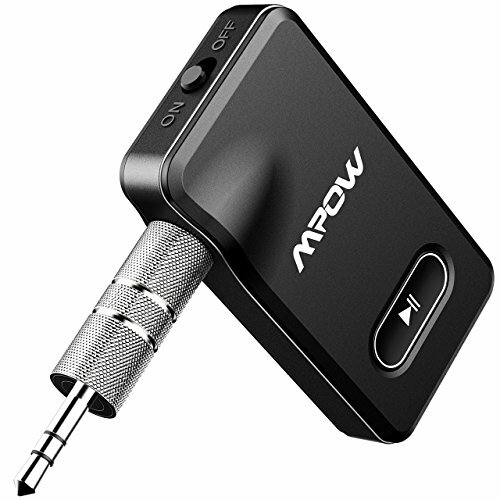 ENJOY WIRELESS HI-FI MUSIC: Mpow Bluetooth 4.1 Receiver for faster and more stable connectivity to turn your car audio systems, wired headphones, speakers into Bluetooth-enabled devices.Mpow supports A2DP/AVRCP/HSP/HFP and 33 feet Bluetooth signal. BUILT-IN NOISE ISOLATOR TECH: Mpow noise isolator is built into cable, needless of connecting other audio switching cables to guarantee premium sound both in playing music and answering phone calls. 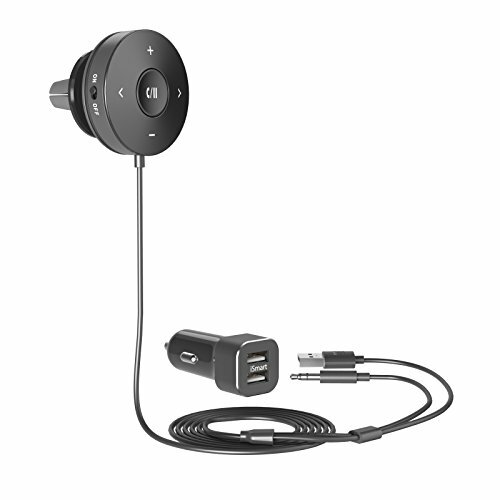 Moreover,this bluetooth car adapter features over-current protection and brings full duplex sound quality. HIGH-PERFORMANCE CAR CHARGER: Equipped with 2 USB charging port: 1A output is recommended for charging the receiver and the 2.4A output for other devices like ipad, phones.Mpow Bluetooth adapter can charge your iPad at full speed. DUAL-CONNECTION: Mpow Bluetooth car kit makes it possible for you to connect two Bluetooth devices simultaneously so that you could switch the music between two phones casually or enjoy high and clear music without missing your phone calls. ONE-KEY OPERATION & BUILT-IN MIC FOR SAFER DRIVING: Comes with special one-key design, through which you can answer/reject/hang up/ redial and voice dialing(if available) phone calls. There is no need to worry about distraction brought by looking for various buttons and the built-in Mic allows you to make hands-free calls easily while driving.